Mobile phone operator O2, owned by Spain's Telefonica, has won the exclusive contract to sell Apple's much-hyped iPhone in the UK. The phones will be sold in O2, Carphone Warehouse and Apple stores from 9 November costing £269 including VAT. "We are coming to the UK and wanted to pick the best carrier and that is O2," Apple chief executive Steve Jobs said at a news conference in London. Users will get free use of 7,500 wi-fi hotspots giving faster internet access. Given the high price that customers will face, will the iPhone prove such a great deal? Can iPhone woo UK buyers? It has not yet been announced on what terms O2 won the contract. 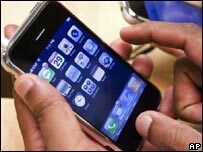 Customers have to sign up for an 18-month contract on a tariff of £35, £45 or £55 a month, all of which will include unlimited mobile data usage. The iPhone is a mobile phone handset with a touch-sensitive screen, combined with a built-in iPod media player and wireless media browser. However, unlike most modern phones the iPhone can not use high-speed 3G networks. Instead, it will run on Edge, which works on the existing networks and is much slower than 3G. The iPhone was launched with great fanfare in the United States on 29 June. They flew off the shelves at first, but last week Apple cut the price of the eight gigabyte version of the iPhone in the US from $599 (£300) to $399 (£200). The price-cut sparked concern that sales were slowing, although Apple then announced that it had sold one million iPhones ahead of its target date of end of September.